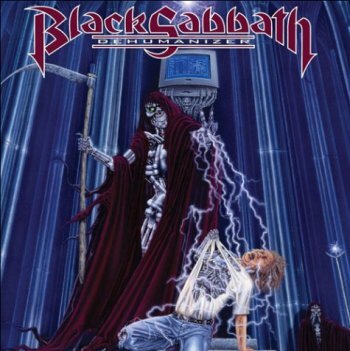 BLACK SABBATH - DEHUMANIZER SPECIAL EDIT. (2CD DIGI) | Online Shop | Wizard LTD. Album: "DEHUMANIZER SPECIAL EDIT. (2CD DIGI)"
BLACK SABBATH Dehumanizer (2011 issue UK Special Edition 18-track digitally remastered 2-CD album - Arguably one of Black Sabbath's heaviest albums, 'Dehumanizer' features the vocals of the late, great Ronnie James Dio along with founder members Tony Iommi and Geezer Butler, completed by the heavy hitting drums of Vinny Appice; the line-up that created 1981's epochal 'Mob Rules' and 1983's 'Live Evil'. This 2011 edition is expanded with the single edit of 'Master Of Insanity', an alternate version of 'Letters From Earth' that originally appeared as the b-side to the 'TV Crimes' single, and a version of 'Time Machine' recorded for the soundtrack to the movie 'Wayne's World'. In addition, the set also includes five rare live tracks from Florida's Sundome recorded at the beginning of the Dehumanizer tour in July 1992, including a previously unreleased live version of 'Master Of Insanity'. Presented in an 8-panel digipak sleeve complete with sleevenotes from Classic Rock and Metal Hammer's Dom Lawson, based on new interviews with Tony Iommi).